This promotion is not intended as investment advice. Your capital is at risk when you invest in shares – you can lose some or all of your money. Never risk more than you can afford to lose. Past performance is not a reliable indicator of future results. Always seek personal advice if you are unsure about the suitability of any investment. It was a heck of a scoop. In 2015, taking things easy after a successful 17-year stint at HSBC, Charlie Morris had no reason to end his retirement. He’d just completed the Camino de Santiago, a 500-mile walk across Spain. But we managed to get him to work for us, here at Southbank Investment Research. We knew Charlie’s ability to make money would prove invaluable to our readers. All he had to do was make our readers richer – however he wished. That decision has been vindicated. This is someone who had reached the absolute peak of the financial industry – by making his clients a fortune over 20 years, managing $3bn for extremely wealthy clients (like sovereign wealth funds; CEOs of Britain’s largest companies; entrepreneurs from India, Hong Kong, Bahrain and Spain; private banks; premiership footballers; and A-list actors). It was a huge coup to convince someone of that calibre and experience to start sharing their most valuable investment ideas directly with private investors. I was delighted at the time – now even more so. His work is fast becoming the best performing research we publish. Many reasons. The picks have crushed the market. Readers write in by the dozen praising his work. It has the steadiest, most loyal readership, with incredible renewal rates. That means, after trying it out for themselves, investors are overwhelmingly happy with Charlie’s work. Charlie Morris is unlike any financial expert I’ve ever met. He doesn’t make his living as a “pundit”. He’s not a journalist or talking head. He’s risen to the top of his profession by rolling his sleeves up and making money from the markets year in, year out. Anyone who knows him will tell you that working with Charlie is intense. His mind moves at a thousand miles an hour. I’ve never met anyone capable of coming up with so many money-making opportunities… so quickly… and so regularly. More often than not, Charlie’s ideas come off. In fact, as Head of Absolute Return at HSBC he doubled his clients’ money through one of the most turbulent periods in market history. And he did it while managing $3bn. That’s past performance – which should not be your sole consideration when making any investment decisions. It is NOT a reliable indicator of what will happen in the future. What Charlie’s results in his career do show is that he is remarkably good at managing money. One of the best in the business. So when he joined us here at Southbank Investment Research, our instructions were clear: show our readers how to make as much money as they can, as safely as they can. DB Taiwan ETF sold for a 37% gain! Remember: these are all real gains Charlie made for real investors in the last year and a half. It’s early days, certainly. But those results are impressive by anyone’s measure. Charlie might expect to hold an asset for a year, two years, maybe longer. What we have seen so far is very early promise. Charlie quickly built up the best performing research service we publish. In fact, since Charlie's portfolio began in January 2016, his recommendations have outperformed the FTSE 100, FTSE All-Share, ASX 200… which is superb, considering how well those markets have also performed. And his readers received his guidance for a fraction of what he’d customarily charge in the City. As a fund manager, the smallest account Charlie would consider was £500,000. He charged a minimum of £5,000 a year. These days… he’ll share his advice directly with anyone, regardless of how much money you have… and for less than 3% of what he’d charge his wealthy clients. It’s no wonder his readers are astounded by Charlie’s results (and his methods – which we’ll come to in a second). There has NEVER been a more important time to have someone like Charlie on your side. But you get the point I’m sure. Charlie has an incredible track record. He has incredible experience. And he’s willing to show you EXACTLY where to invest right now, for a modest fee. How much will it cost you to get his research and recommendations… and what do you get when you take advantage of this deal? That’s simple. The second you take me up on this offer, you’ll get Charlie’s most valuable research sent to you immediately, with your latest issue – and my most up to date recommendation – sent directly to your inbox. Not only that, you’ll get full access to both of Charlie’s model portfolios. Some of Charlie’s picks will be individual shares. Others will be funds (the performance of a fund relies on the performance of its underlying investments). But as you can see, using his experience, Charlie doesn’t make a call until he is confident in its potential to perform. Plus, you’ll see all of his upcoming picks – sent to you directly via email. Again: this kind of high-level analysis is not available anywhere else in this way. Not from someone with Charlie’s credentials. It’s like having Neil Woodford or George Soros presenting their picks to you personally, basically for free. You’re free to follow them or not follow them – it’s your call. You’re in control. But you have a titan of the industry in your corner. Think back to how you felt the morning after Brexit. Or how you felt when the “flash crash” in the pound happened. I know many people out there were shaken… and confused. Or when Donald Trump became president. More than anything else this year, that was a signal that significant changes to the world economy are taking place… changes that’ll affect everyone. And the price you’ll pay if you make a mistake with your money will be huge. What I’m offering you is more than just a way of positioning your money today. It’s the chance to have a seasoned and experienced investor on your side, guiding you and your money through the financial markets and helping you make better decisions with your money. Charlie took the helm as Investment Director of The Fleet Street Letter in January last year. For one, it’s the oldest investment letter in Britain. Its esteemed predecessors include founder Patrick Maitland, the 17th Earl of Lauderdale… Nigel Wray, the £50 million British business tycoon… and the late Lord William Rees-Mogg, former editor of The Times. Since its foundation in the 1930s, The Fleet Street Letter has a track record of pinpointing the big “turning points” in history… and helping British investors navigate their wealth through them. In 1938, for example, after a fact-finding mission inside Germany, Patrick Maitland predicted war in Europe within a year, while everyone else was in denial. On 1 September 1939, Hitler invaded Poland. Two days later the Second World War began, exactly as Maitland foretold. It was the first major world event The Fleet Street Letter correctly anticipated. And by no means the last. The FTSE peaked four months later, falling into a three-year bear market. It also predicted the fall of communism, the 1980s property boom and 1987’s Black Monday where UK stocks plummeted 27% in a fortnight, and the boom in Taiwanese shares in the mid-90s. My point is, The Fleet Street Letter explores ground the mainstream doesn’t. It’s been doing this for its readers for the last eight decades. And by doing so, you gain an advantage. I don’t mean that in a general sense, either. I mean you’ll be able to measure just how valuable Charlie’s work is by the results in your investment portfolio! 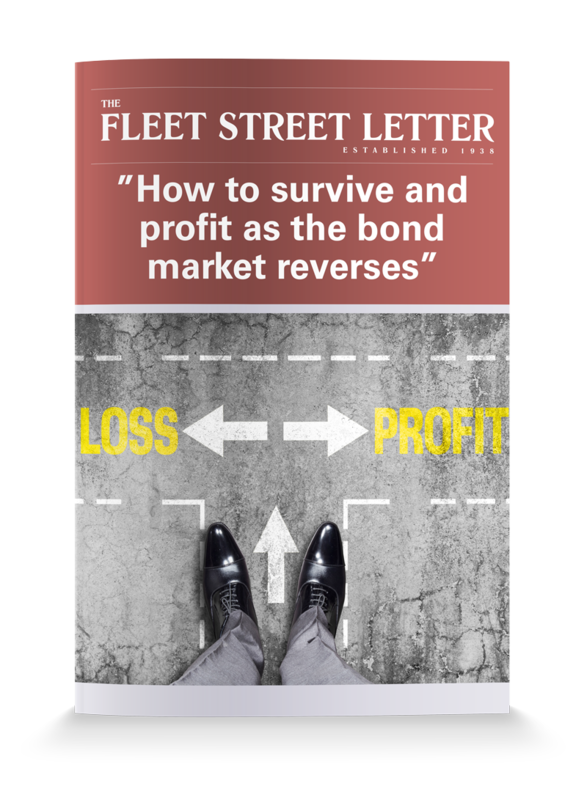 The Fleet Street Letter couples “big picture” political and economic analysis with detailed and fully researched investment recommendations. Charlie shows you EXACTLY where he recommends you put your money… how much of your portfolio you should consider investing… and then precisely when it’s time to sell up and move into something else. To be rather blunt, this is the same set of ideas he gave his City clients for 17 years. His fees came in at thousands of pounds and you needed a pot of half a million pounds to qualify for his advice. But now he offers that very same level of analysis to any investor… but directly to you, and for 3% of the price. The only difference is, you’re still in control – Charlie gives you specific advice, but it’s your choice whether you act on it. That means detailed, fully researched investment recommendations, starting with your FREE bonus research report: “How to survive and profit as the bond market reverses”. Weekly updates and analysis on the markets and specific companies or funds Charlie recommends. Two separate portfolios – a safer, less risk averse one called “Soda”… and a risk on, aggressive portfolio called “Whisky”. Buy AND sell advice – Charlie will get you in and out of positions when the time is right, helping you take profits and cut losses. This is a huge advantage – it means you can rely on Charlie’s judgment to time your investments rather than guessing. Detailed research into the key issues affecting the macro-economic outlook for investors – that might be political (Brexit), economic (UK productivity) or financial (why value will beat growth). Whatever Charlie chooses to write about, you can guarantee it’ll make you a better, more informed investor. Insights from inside the political and financial bubble – for instance, last year Charlie held an exclusive interview with Steve Baker MP on the current preparations for Brexit negotiations. There’s much more, but to be frank you’d probably rather SEE what The Fleet Street Letter is all about yourself, rather than have me tell you about it. Imagine one day, out of the blue, Warren Buffett writes you a letter. In this letter he tells you he’d like to send you specific share recommendations – he’ll write to you once a week with a new tip, all his analysis on the opportunity and guide you through the investment and provide you with regular updates on important developments. Not only that, he’ll keep writing to you to update you on the share’s performance… and tell you exactly when it’s time to sell. Now imagine he tells you he’ll send you these types of investments for 30 days as a trial, so you can TRY what he’s offering and decide for yourself. You’d bite his hand off, right? I mean, given Buffett’s reputation, you’d be mad not to at least TRY his work, wouldn’t you? You’d have a top-ranking investor guiding you to stocks to buy – and you wouldn’t have to commit to anything until you’d seen his picks for yourself. In short, this is exactly what Charlie Morris is offering you today. See Charlie’s entire portfolio including all his recommendations for right now. And if you don’t like what you see… walk away with a full refund. And as an offer, it doesn’t get simpler. And it doesn’t get any better. How much does Charlie’s work cost? Like I said: not a lot. To get Charlie’s advice at HSBC in the City… you needed £500k to invest. And you paid £5,000 in fees. And plenty of people did. Charlie managed the money of entire governments, sovereign wealth funds and wealthy sports stars. Now, he helps anyone who wants to make more money from their investments. And he does it for a fraction of the cost. One year of Charlie’s research at The Fleet Street Letter costs just £477. But for a limited time only, you can get your first year of Charlie’s work for just £347 – saving you £130 on the normal price. But that’s not a commitment I expect you to make today. I know that if I were in your shoes, I’d want to SEE whether Charlie’s work is as good as I’m saying it is, before committing. So I’m giving you 30 days to try it out under no obligation to continue. So if you don’t believe Charlie’s picks have potential to perform… you can walk away. If you don’t like Charlie’s style or the kind of investments he picks… you can walk away. If you are not comfortable with the level of risk involved… you can walk away. If ANYTHING doesn’t match up to what I’ve been saying… just walk away. I’m the one taking all the risk here. My 30-day iron-clad publisher’s guarantee protects you of that. That way, if you like what you see… you get the lowest price you’ll ever see. If you don’t, you walk away with a full refund. But an outstanding value one. You can take advantage of it by clicking here now. I’ve shown you Charlie’s ideas… his track record… his experience in the City over nearly two decades… And I’ve shown you how to lock in the current low price AND get a free copy of Charlie’s latest research“How to survive and profit as the bond market reverses”. Understand and capitalise on it and you could grow your wealth month on month, year on year, decade on decade. That’s how people get rich from the stockmarket. And that’s what Charlie wants to help you do. Now it’s up to you if you want in to see Charlie’s work and capitalise on it. I think you’d be mad not to try this out,personally. Click here now and take advantage of this low price deal while you still can. 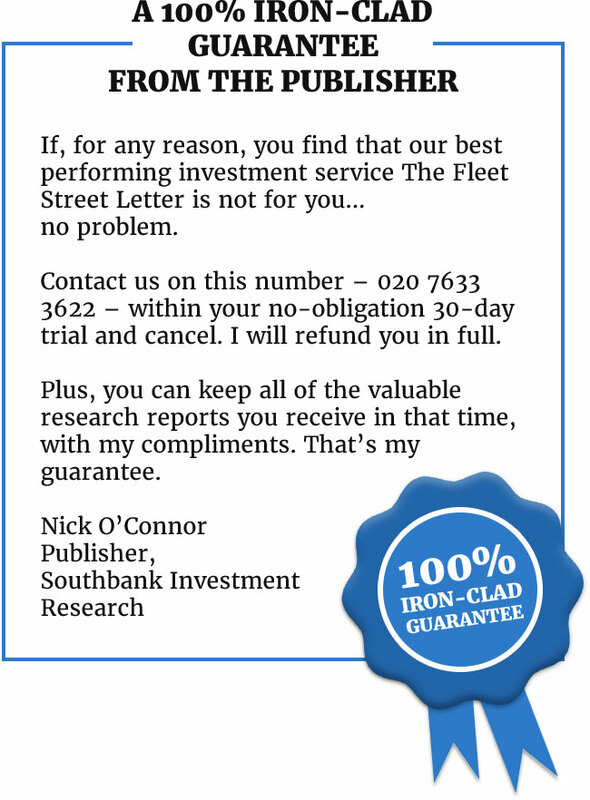 PS What also might be of interest to you is this… of all the services we publish – from trading letters to tech advisories to income strategies – The Fleet Street Letter has the highest rate of renewal. That means, after trying it out for themselves, investors are overwhelmingly happy with Charlie’s work. Considering his track record and expert analysis, that’s no surprise. Try it and see for yourself what Charlie’s research and recommendations can do for your money. Taxation – Profits from share dealing are a form of capital gain and subject to taxation. Tax treatment depends on individual circumstances and may be subject to change in the future. Investment Director: Charlie Morris. Editors or contributors may have an interest in shares recommended. Information and opinions expressed do not necessarily reflect the views of other editors/contributors of Southbank Investment Research Limited. The Fleet Street Letter is issued by Southbank Investment Research Limited. Registered Office: 2nd Floor, Crowne House, 56-58 Southwark Street, London, SE1 1UN. Southbank Investment Research Limited is authorised and regulated by the Financial Conduct Authority. FCA No 706697. https://register.fca.org.uk/. © 2018 Southbank Investment Research Limited.